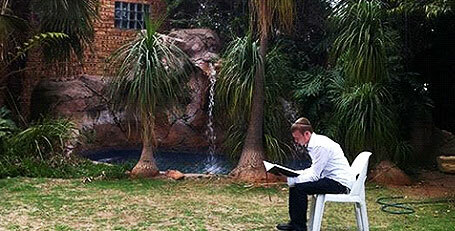 Yeshiva Gedolah Lubavitch Johannesburg | Yeshiva with Authentic Chassidishe Atmosphere. 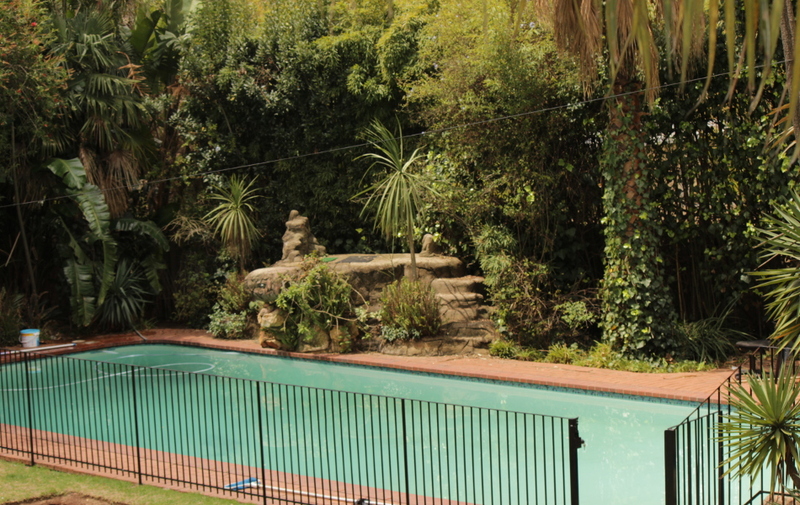 42 Nicolaine Road, Sunningdale, Johannesburg, South Africa. Yeshiva with Authentic Chassidishe Atmosphere. 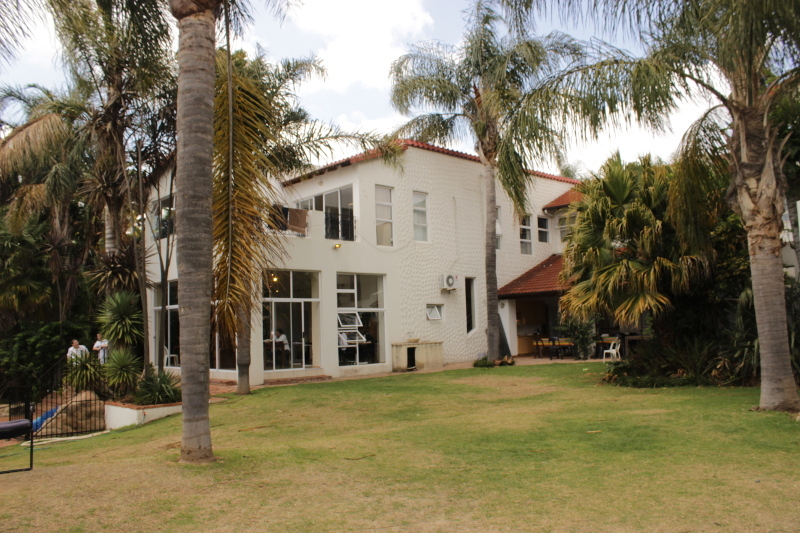 In the year 5744 (1984), ten Bochurim were selected by the Rebbe, and sent as his Shluchim to establish a Tomchei Temimim Yeshiva in Johannesburg, South Africa. Ever since then, Yeshiva Gedola Lubavitch has impacted not only the lives of it’s students, but of the entire Jewish community of Johannesburg, and many other communities throughout Southern Africa. 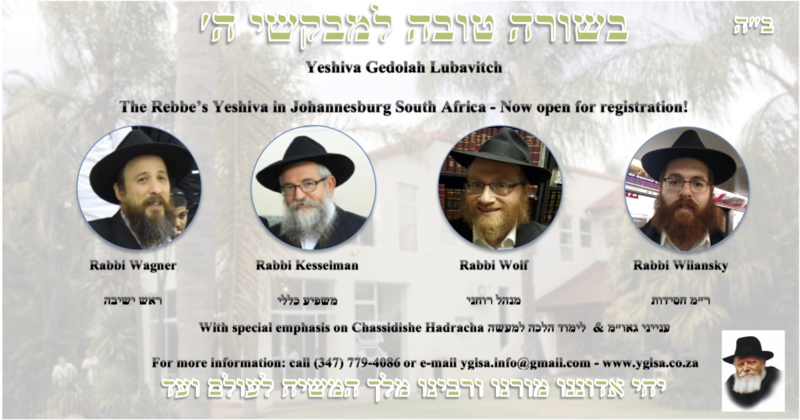 Yeshiva Gedola Lubavitch of Johannesburg has since become synonymous with the word “Chayus”; a place permeated with life – living with Torah & Mitzvos infused with the spirit of Chassidus, living with the Rebbe & the immediate Hisgalus of Moshiach. At the end of the year of תשע”ז the Yeshiva will be opening its doors for the new Z’man with the following major improvments. Also, two excellent מגידי שיעור for Nigle are currently being spoken to. Their names will בע”ה be disclosed very soon. These members of הנהלה together with some of the local רבנים & Shluchim will dedicate themselves 100% to the growth & success of each & every Bochur. The Yeshiva is now geared for serious Bochurim who for a full complete year, will totaly immerselves themselves in learning & Chassidishkeit, under the expert personal guidance of the משפיעים & ר”מים, while enjoying the serenity & peace of mind afforded by the beautiful grounds of the Yeshiva, far away from all distractions. In order to make sure that the best possible group & combination of Bochurim are accepted, the registration process will extend from the middle of שבט until shortly after פורים. During this time, every בחור will be thouroughly looked into, by speaking to his past Hanhalos & teachers, followed by a personal Farher & interview. After Purim, when there has been adequate time to research all the applicants thoroughly, a group will be formed, consisting of the applicants that are found to be the most fitting for Yeshiva. With Hashem’s help, the group should be finalized sometime in the begining of Nisan. The Yeshiva is offering you a year with no worries whatsoever, where all your גשמיות needs are taken care of בהרחבה, and you are in the company of people who truly care about your specific needs, whatever they may be, and are commited to give you all the tools thay you personally need, to help you become all that you can, in a calm & wholesome manner. In order for the Yeshiva year to be a proper full year from which the בחורים can get the maximum amount of תועלת, the זמנים will work in the following manner: The first זמן begins in Tamuz & continues until before Yom Kipur, spending the last 2 weeks (from Shabbos Slichos until just before יום כיפור) in CH by the Rebbe. The 2nd Z’man is from Cheshvan until Nissan, and the 3rd – Iyar & Sivan. At all times, the staff is in tune with all Bochurim’s needs for recreation and the like, insuring that they recieve everything that can achieve the most constructive learning & עבודה.